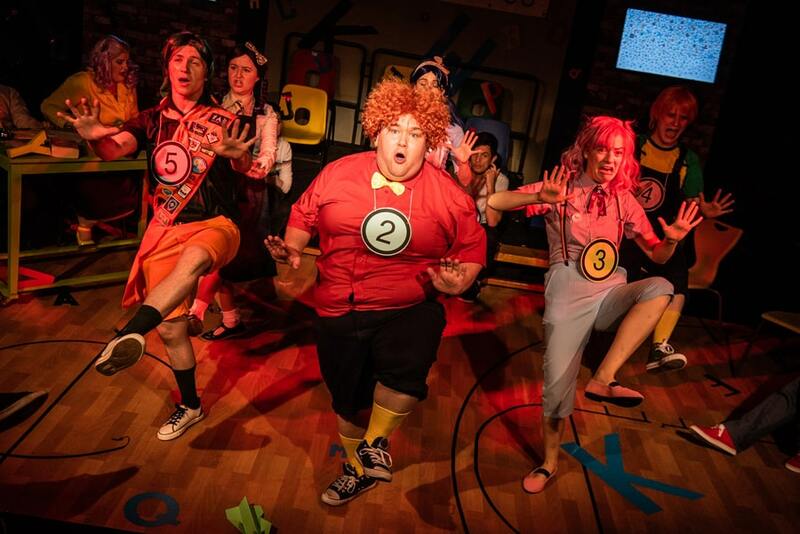 It is rare that a large-scale musical can be performed to its full potential in a tiny, unventilated room above a pub, but MKEC’s latest production of The 25th Annual Putnam County Spelling Bee does exactly that – and then some. This show is wildly entertaining, with clear directorial choices from Adam Haigh that gives the piece brilliant shape, and dedication to the characters and their stories. The decision to have the actors in the space as the audience enters is a risky one – and at first a little jarring. But, once all are settled in their seats, it is exciting to see the actors play within the space. Fantastic casting comes into play here too, with each and every actor representing these kooky characters as well-rounded and three-dimensional. The skills they possess as an ensemble are also a masterclass in showing exactly what air-tight harmonies can do when executed properly, often electrifying the space and the audience alike (credit to MD Keiran Stallard for this one!). The clever choreography (again from Adam Haigh) also lends itself to the small stage and makes the most of its spacial limitations by only heightening the performance quality. Stand out performances come from Elizabeth Chadwick who plays the former spelling bee champ turned officiant Rona Lisa Perretti, whose vocals are absolutely flawless throughout and whose characterisation is charming and complimentary to the entire cast. Other honourable mentions include Lottie Johnson, whose portrayal of the erratic and highly anxious Logainne Schwartzandgrubenniere is absolutely hilarious as well as heartwarming, and to Inti Conde who effortlessly fills the room with his mammoth voice, as the not-so-enthused counsellor to the kids, Mitch Mahoney. This high energy piece has it all – laughs, bells and unfortunate erections. And with such a strong cast and crew behind it, it is clear that this particular production can only continue to be one of the best. The 25th Annual Putnam County Spelling Bee runs through 16 June.